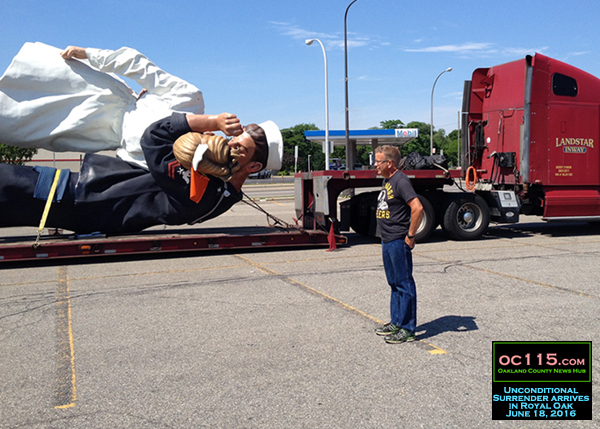 Royal Oak, MI – The statue is here. 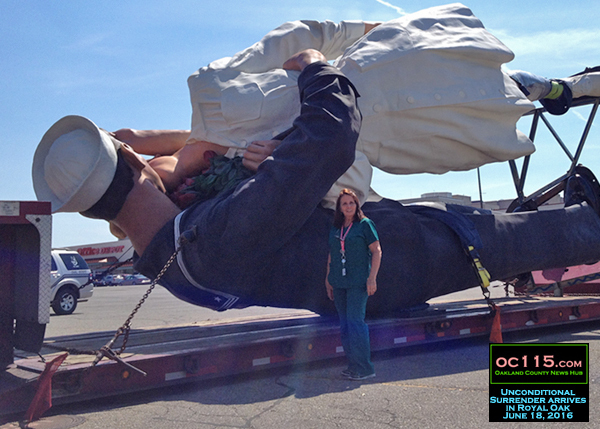 Parked in the lot of the former Kroger store at 13 Mile and Woodward, the 25 foot “Unconditional Surrender” statue arrived Saturday and will be erected Monday morning in Memorial Park. 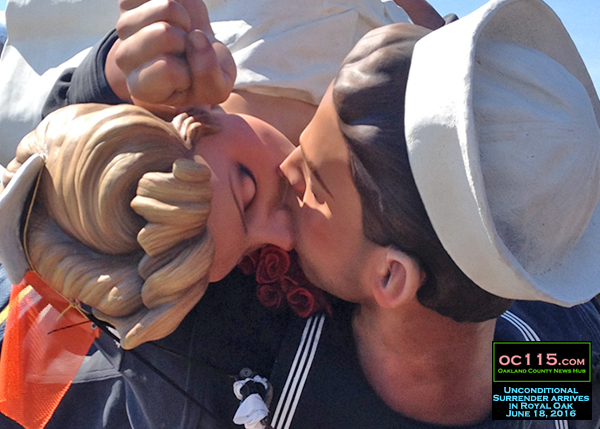 The statue, created by Seward Johnson, is an homage to the iconic photograph by Alfred Eisenstaedt featuring an intoxicated sailor grabbing an unsuspecting woman in Times Square and kissing her at the end of World War II. 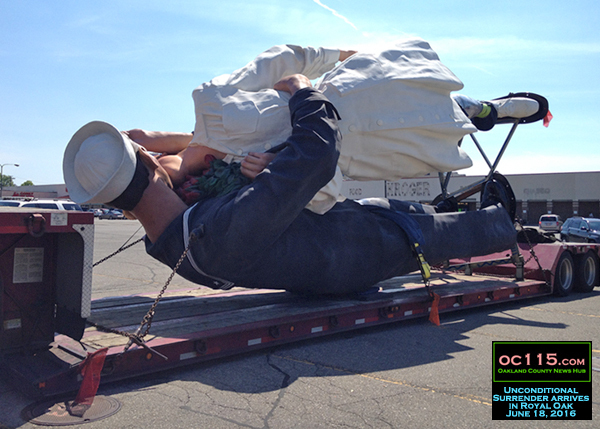 The statue will be lifted into place with a crane. Mayor Jim Ellison will be on hand along with several veterans to share in the moment. According to a Press Release, The Michigan WWII Legacy Memorial will provide a year-round multi-purpose destination that will tell Michigan’s unique story while encouraging visitors to both commemorate and celebrate their freedom. It will also serve as an inspiration for future generations, enlightening us all about these hallmarks of remarkable patriotism, selfless sacrifices and extraordinary devotion to liberty that helped save the world. For additional information about the memorial or to donate, go to www.michiganww2memorial.org. 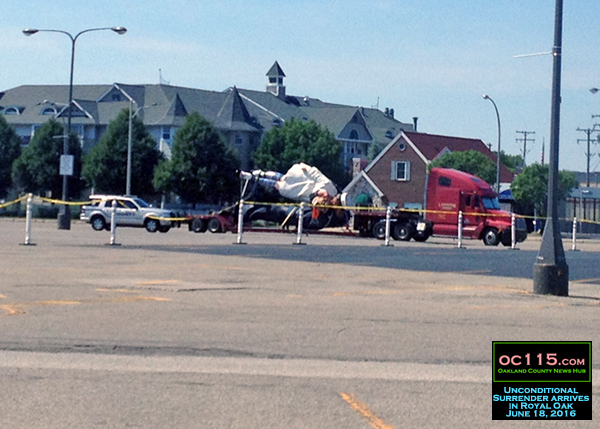 Note: This story has been updated to include more information about the memorial that is planned.